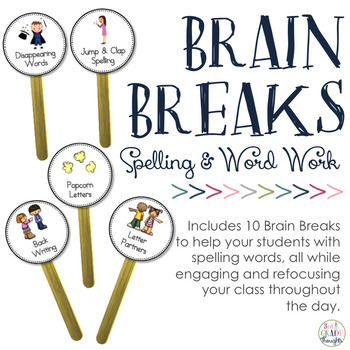 This is a collection of 10 different Brain Breaks for the classroom to help practice spelling words in engaging, kinesthetic ways. These can be used as transitions, breaks in the middle of an activity, something to raise or lower the energy of the group, partner or whole-group activities, and more! Activities are focused around practice any spelling word and incorporate a lot of movement and partner work. Breaks range from simple, partner breaks to whole-class games, so there are many ways to use these into your classroom during the school year and for any word list!